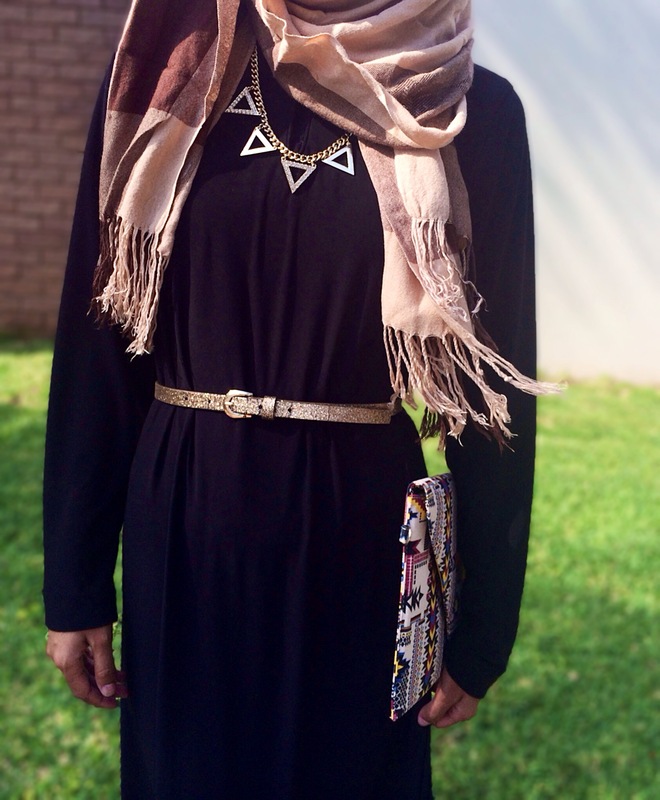 A few weeks ago, I reviewed a Chinese collared abaya and a few scarves and accessories that I received from the very sweet Yasina, the mastermind behind Damasq and Hijabi. So, I thought why not feature these wonderful products in an OOTD post instead of just telling you guys about it! 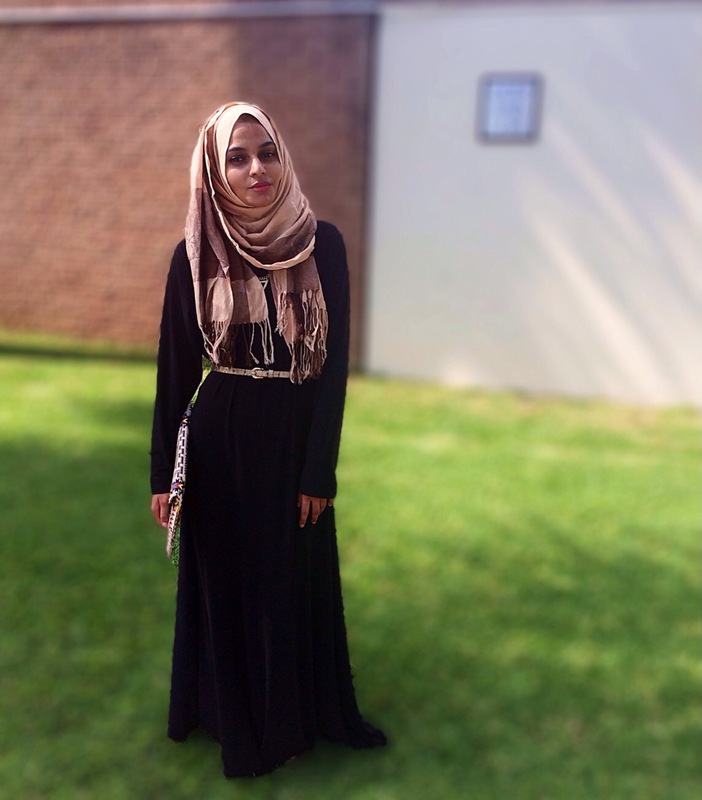 I’m starting off the features with the very simple yet beautiful Chinese collared abaya. 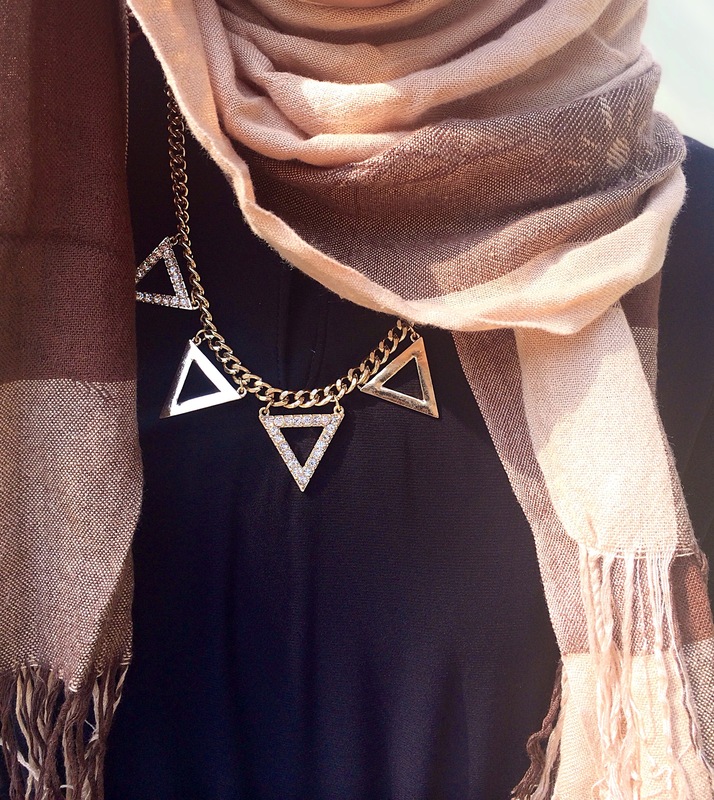 Unfortunately, in this post you can’t see the actual Chinese collar because of how my scarf is styled – but I do have an image of it here, if you’d like to see. Even though, it does have such a collar, it doesn’t suffocate you at all. I’m one of those people who hate polo necks because of how claustrophobic it makes me feel, so I really was quite surprised that the Chinese collar still allowed me to breathe –really!! 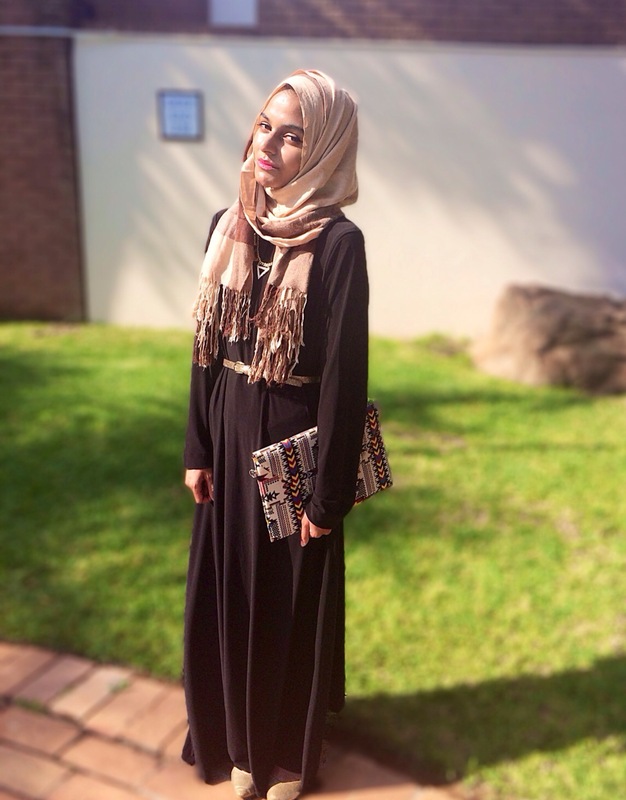 I decided to pair this abaya with neutral colours, so I stuck to gold, beige and a few shades of brown. And because it’s black, it’s quite versatile in the sense that you can pair it with any colour and it will look fab. 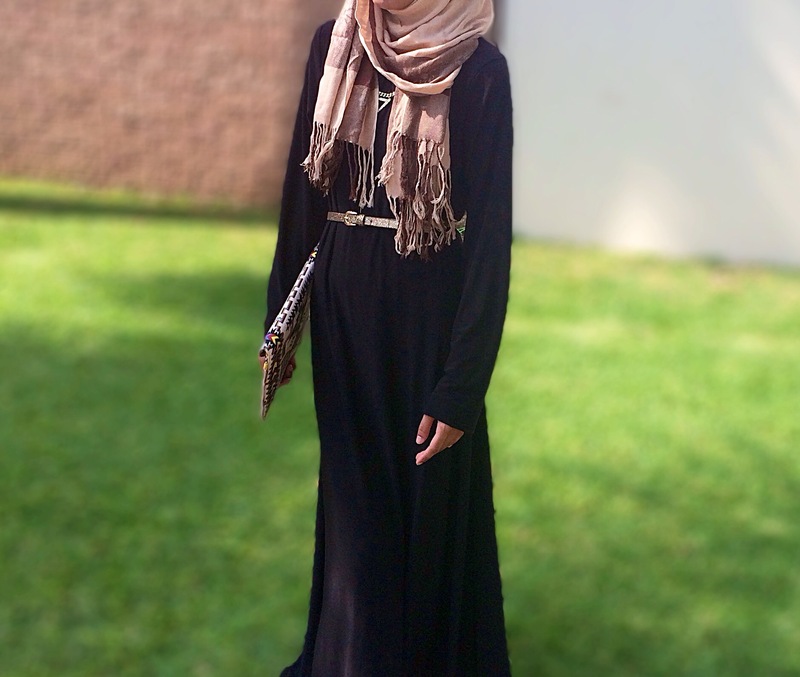 I see the abaya as more of a maxi dress than an abaya as it’s flexible in terms of styling it. Most abayas are already kitted out with some bling or flowy sleeves so there isn’t much room to play around with when it comes to styling it. With this abaya, you can literally just throw it on along with a scarf and a pair of shoes and be on your way – or you can belt it and accessorize it if you want a more structured and thought-out look. 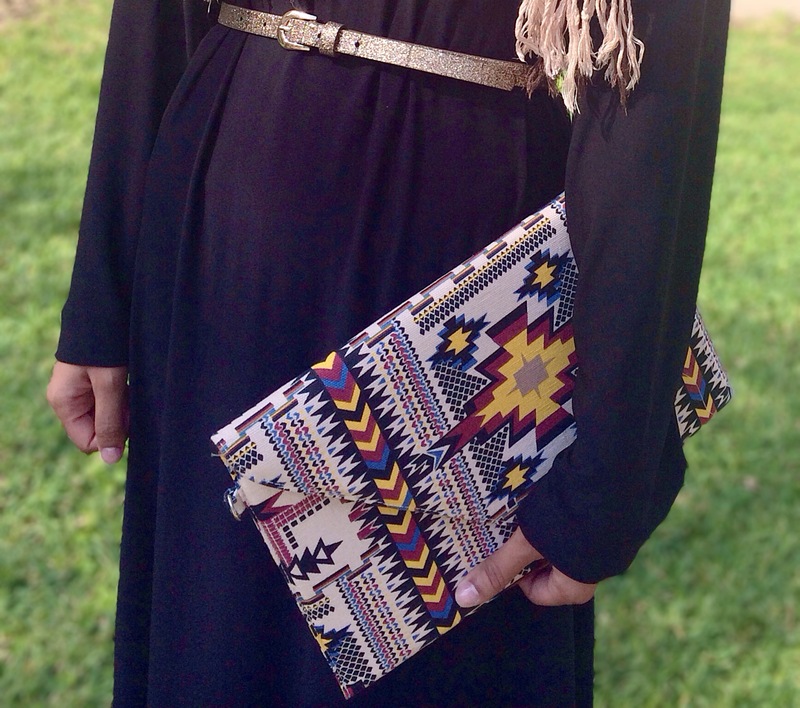 I paired my abaya with a skinny gold belt, gold D’Orsay pumps, a gold triangle necklace, a printed envelope clutch and a pashmina worn as a head scarf. But you can always pair it with some heels, a turban and a shopper bag – if that’s your go-to style. As I said, it’s quite flexible so anything goes! If you are into maxi dresses or abayas, I really would suggest you get yourself one of these -you can even pair it with a biker jacket or a maxi cardigan if you’d like to see it transition into a Winter piece. You can find it here for just R299! 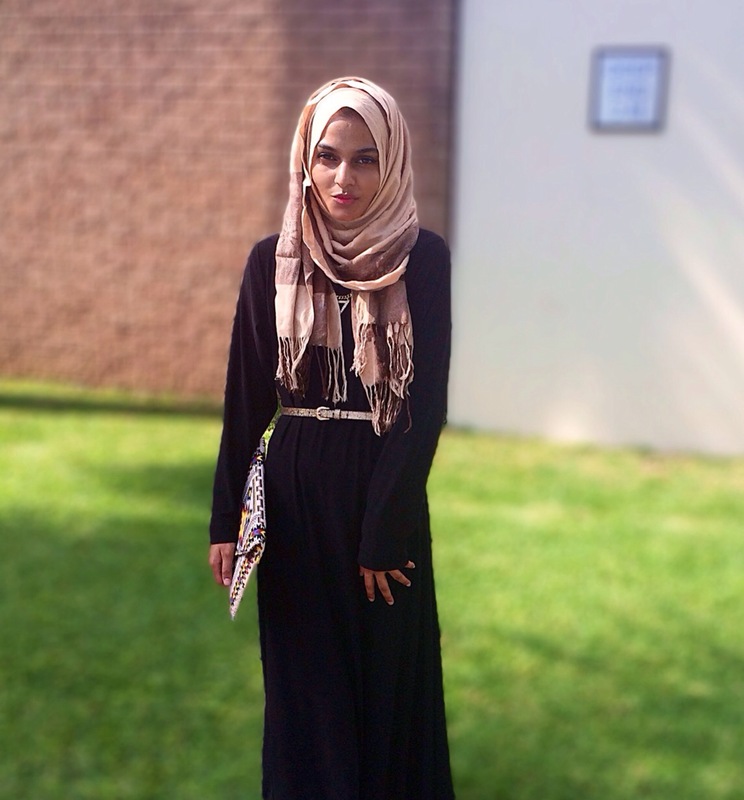 Btw, look out for my next OOTD post that will feature the Summer Swirls maxi scarf from Hijabi, which you can find here. It looks so pretty ❤️love it!